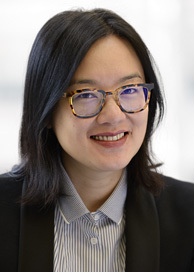 Dr. Leung is an Assistant Professor at the Department of Psychiatry, Faculty of Medicine, University of Toronto and Research Scientist at de Souza Institute. Yvonne’s research interests are to design and evaluate psychosocial interventions for cancer patients and families to improve quality of life and care. She has received several awards and completed two post-doctoral fellowships fully funded by CIHR and OCI in supportive care at the Princess Margaret Cancer Centre to study psychological adjustment of family caregivers using an expressive writing support group. Prior to joining the de Souza Institute, Yvonne led the analytical work of a province-wide patient experience survey and created composite quality improvement indicators for the Patient Experience and Person-Centred Care Program at the CCO. This work potentially leads to meaningful and sensitive indicators to capture different aspects of patients’ cancer journey. Yvonne is currently developing an Artificial Intelligence based system to assist the delivery, evaluation and referral of an Online Support Group service, which will in turn lead to a safer online intervention while reaching a broader population with access barriers.